I guess peplum tops aren't really cool any more but I still really like them. I love the shape and I think they are a nice way to add a little bit of femininity to a casual jeans-and-sneakers outfit. This is Simplicity 1425 from a few years ago. When I looked up how other bloggers were making it, I was actually surprised to see how many people were sewing it up as written, with a weird button back closure. It's easy to swap out for a zipper, and I think it makes it much more functional! I also ditched the yoke, taping that piece to the center front along the seamline. I love the collar-- If I make another of these I'll change the construction so there's less hand sewing, but it looks really nice I think. 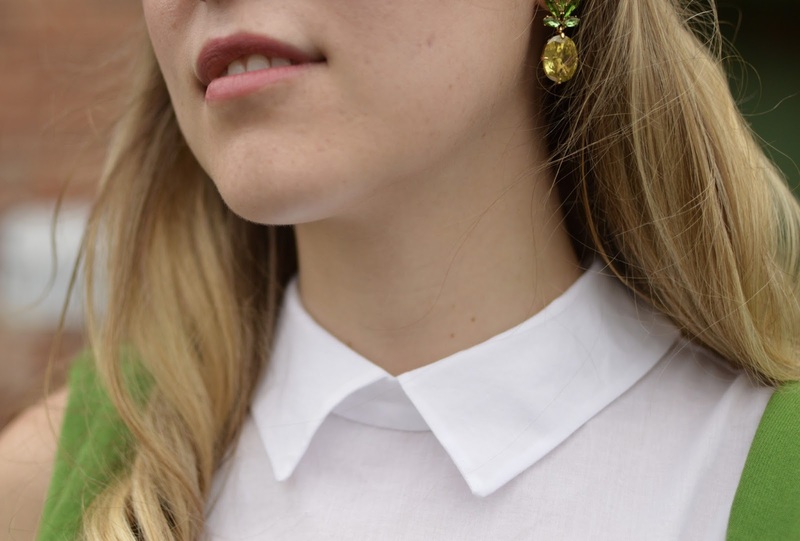 After making several peter pan collar shirts last year, I think I've given up on sewing collared shirts without collar stands, they just never look as good. This is obviously a little different, but I think the principle is the same! Simplicity patterns fit me so well out of the package--people hate on big 4 but I like the standardization. I also like that they are $1 and I don't feel guilty about cutting right in--no tracing for me! This is a straight size 8. I think it is a smidgeon big in the upper chest but that could just be because of my pattern hacking. I messed up the pleats, but anyway, I don't think I really like pleats on a peplum? I've never done a circle but I think I would like that better for a low-volume peplum, but who am I kidding--I like ruffles! I have a ruffled peplum on my work table now, so you'll be seeing one of those soon! What do you think? Pleats on a peplum? Circle "skirt"? Ruffles? Or are you over peplums as a whole? I don't think this looks too big in the upper chest. I am so jealous that you fit into a "size" without alterations! I am hoping to find that someday...I think that the peplum style looks great on you and you can just keep wearing them forever...just update the color and fabric choices to be "on trend" and go for it! Certainly can't go wrong with a white shirt, jeans and keds. What is going on on Friday? I think peplums are making a come back. I've recently picked up a few peplum patterns myself. I'm a fan of the Big 4. There's always a ton of new patterns, they're cheap, and on trend. Plus, like you, I don't want to trace a dang thing if I can get away with it. Love a peplum and perfected one for myself last year after plenty of hacks of a Japanese pattern! This is so cute and I like the collar for a bit of interest. And where on God's green earth do you live where Simplicity patterns (or any Big 4) are $1???? Generally $18 here (Australia) and at the very least about $5 on very rare sales. I consider them hugely expensive :) Unfortunately they fit me really badly too, so I'll stick to Japanese pattern books. Ah I knew they were more expensive but I didn't know they were THAT expensive! Here, the envelope will say $12-$20 (about), but JoAnn's (like spotlight, I think?) has them permanently at 40% off... And then every few months they go on sale for 3/$5 or 10/$10! I almost NEVER pay more than 2 or 3 dollars for a big 4 pattern... I don't know how they make any money in the states!! It looks nice and suits you so well. Also, love that tiny satchel! Can I ask how you choose your size with big 4 patterns? Do you use the body measurements chart or the finished measurements? I've only sewed one big 4 pattern so far and there was much more ease than I wanted, so it seems that I need to size down from what the body measurements chart suggests. My bust measurement is about 33", so according to the package, I'm between a 10 (32.5") and a 12 (34"). However, when I look at the finished measurements, that would be 36 or 37.5" and I know I don't need 3 or 4.5" of ease in the bust!! Looking at the completed garment measurements, a 6 (34" bust) or 8 (35" bust) looked like they would work. I picked the 8 partially because a completed garment measurement of 35" would either fit or be a bit too big (easy to take the seams in a bit!) and partially because I have some experience with simplicity patterns and in the past when I have tried to sew size 6s they are skin tight, which is not my style. I do find all the patterns in a range to be fit similarly, so I generally know that I will like 8s or 10s in simplicity.